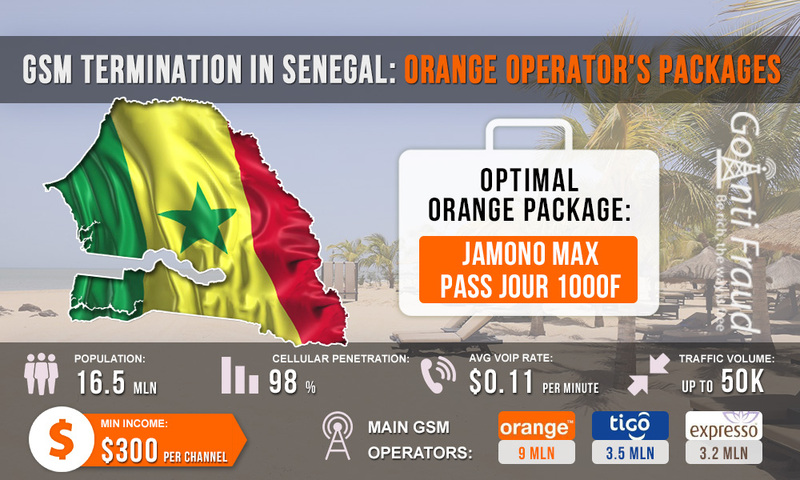 The telecommunications company Sonatel operates in the Republic of Senegal under the Orange brand. Orange is the largest mobile operator in the country, it owns about 55% of all mobile subscribers. It has the best coverage in Senegal but the prices for tis services are higher than those of competitors. Nevertheless, Orange SIM cards will be one of the best solutions for profitable VoIP traffic termination business. Orange's SIM cards are called ‘puce’ in Senegal and are sold in Orange stores. You can also get them right in the street - from local merchants. One starting plan costs $1.7 and a loan for the same amount is on your account right away. The prepayment line is called diamono and provides a bonus of 100% of the amount of the first topping-up. Top-up scratch cards are sold at many street kiosks. Jamono Max. 50 minutes a day - $1; 200 minutes a day - $1.7; 25 hours for 7 days - $10. Jamono Allo. 30 minutes a day - $0.85; 200 minutes a day - $1.7; 20 hours for 7 days - $8.4. Jamono New S'cool. 25 minutes a day - $0.85; 200 minutes a day - $1.7; 120 minutes for 7 days - $3.2. Illimix Allo. Unlimited calls - $17. Jamono Max 1000F, Jamono Allo 1000F and Jamono New S'cool 1000F are suitable plans for a profitable termination. They all differ only in the number of megabytes of mobile Internet traffic, which will not be useful in our work. Choose any of the proposed plans to land the voip mobile minutes.